If you’re on Linux/Windows the best way is probably to download the binaries from the releases page here. 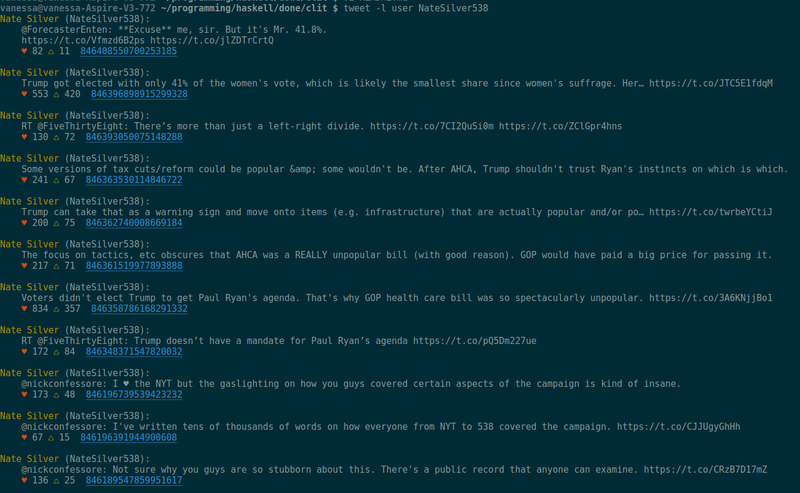 Then type stack install in the directory and it will generate an executable called tweet, which is what we want. To view a user’s profile, type e.g. The directory bash/ has a mkCompletions script to allow command completions for your convenice. A haskell package is included. It’s fairly easy to use once you have the credentials set up, with two main functions: thread and basicTweet: the first for threading your own tweets or replying to someone else’s and the second for just tweeting. The function tweetData will tweet an object of type Tweet. Its use is pretty self-explanatory, but how to best form Tweets is not immediately obvious. Tweet is an instance of Default so you can use def to get an empty tweet replying to nobody and not fetching extended user data. This is especially useful if you want to use lenses and avoid ugly record syntax, e.g. will give you a Tweet with sensible defaults and the desired text.